The energy transformation needs efficient storage solutions and technologies for heat conversion. One of the institutions playing an important role in advancing the transformation of the energy sector is the Fraunhofer Institute for Solar Energy Systems, ISE, in Freiburg. Increasing interest in energy storage technologies as well as efficient heating and cooling processes has led to an expansion of ISE’s research and development capacities and the construction of a new facility in the Auerstrasse. The new building was officially inaugurated on July 2 this year. During the inauguration festivities, Professor Hans-Martin Henning from Fraunhofer ISE announced: “Now, we take the next big step – integrating ‘green’ energies into the system.” Up to now, the use of renewable energy sources has neither significantly impacted the energy network, nor has the production of greenhouse gases been reduced by a considerable margin. In terms of network expansion and supply security, capacity management is of paramount importance, as renewable energy generation has to deal with high fluctuations. Countering those will be one of the main challenges over the coming years. If reorganization of the network and the integration of renewables is successful, Henning estimates that CO2 emissions could be reduced by at least 80 percent. This requires a new concept of managing the so-called residual load. In simple terms, the residual load is the electric power in networks not covered by renewable sources. The more flexible the consumer and producer of energy are, the better they can be aligned with renewable energy use – the simpler their system integration. According to Henning, integral components are the convergence of the heat and power sector, an intelligent management of consumers (demand side management), and an increased use of storage units. Fraunhofer ISE places particular emphasis on energy-saving technologies and efficient processes for heating and cooling supply. Work on these issues has now been moved to the institute’s new location in Freiburg’s Auerstrasse, a site with which Fraunhofer notably expanded the size of its research and development facilities. 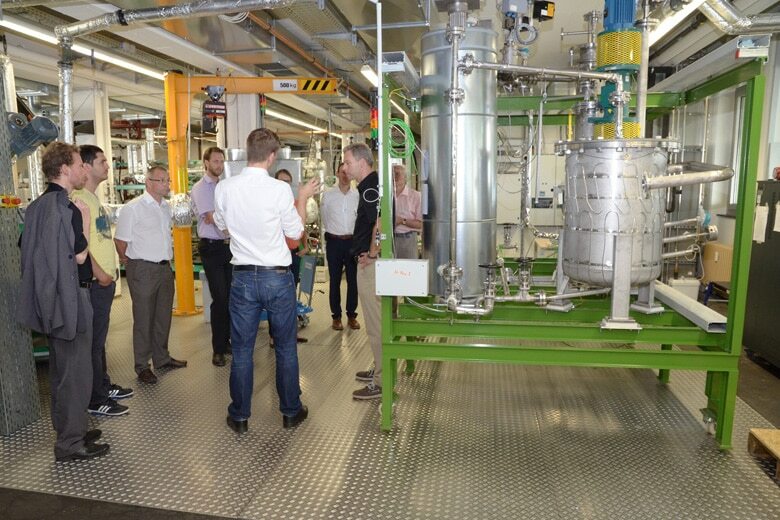 At the beginning of July, the institute’s staff officially inaugurated the new center for storage und heat transfer technologies. One of the key research targets at the newbuild is the “Model of a cost-optimal transformation of the German energy network in line with the country’s political climate change objectives.” Among other things, the model specifies the technologies required to transform the energy sector: heat pumps, stationary battery storage and electrolysis systems. According to Fraunhofer, the electric heat pump will play a crucial role over the next years. Currently, there are around one million units installed across Germany. In the next years, the scientists expect a dramatic increase in installations of these pumps as well as of stationary battery storage units. The latter are said to amount to around ten million kilowatt hours of installed capacity already in 2025. Until then, the first electrolysis systems will have come into operation too. During stage three, which starts between 2025 and 2030, ISE’s scenario anticipates a rise in renewable energy use for synthetic fuel production. At this stage, the experts already expect significant negative residual loads. This means that the electricity generated by renewable energy sources will outpace demand by consumers. By 2040, the Fraunhofer model predicts electric and gas heat pumps to supply most of the required space heating in Germany. Then, the capacity of stationary battery storage could be at more than 25 GWh, and electrolysis systems could already have an output performance of between 30 and 45 GW. With the last stage from around 2040 on, the scientists from Freiburg offer an outlook on the complete replacement of fossil resources in all application areas and a subsequent reduction of CO2 emissions to almost zero. They also expect the import of electricity (e.g., from sunny regions) to reach significant magnitude. One of the technologies that could very likely increase on a massive scale until the middle of this century is the use of electrolysis systems. They may reach a total capacity of up to 70 GW. Most essential to making such a scenario happen, however, is that renewable energy use will be increasing and the transformation of the energy network will be implemented as planned. Germany‘s political climate change targets include a staggered reduction of CO2 emissions compared to the 1990 reference value: by 40 percent by 2020, by 55 percent by 2030, by 70 percent by 2040, and by 80 to 95 percent by 2050. “If we take these climate protection targets seriously, we will need a significant amount of power conversion into chemical storage through electrolysis,” Henning is convinced. Which chemical substances will turn out to be the most popular the scientist does not want to predict at this point. Chemical energy carriers offer the potential to store energy chemically in large quantities even over long periods of time. For instance, hydrogen can be used to power fuel-cell cars, but also to reverse-power stationary fuel-cell units or gas engines. The scientists believe that utilities or grid providers will employ water electrolysis systems to gain more flexibility in production. These systems can help align power generation with demand, stabilizing the line frequency. Henning assumes that over the years, there will be a more or less close network of H2 filling stations. “Hydrogen can be transported without any complications when it has been compressed to almost 1,000 bar. And, for example, filling systems for cars with their 700 bar do have their practical applications and have already been in use.” How dense the network will be and whether hydrogen can become a popular replacement for fossil fuels depends on many factors: from the development of the market for hydrogen-driven cars to total costs and to the future availability of feasible business models. In short: The scientific and technical challenges of the energy transformation are – for the most part – issues already known. And if one is to believe the experts from Fraunhofer, they can be solved too. The Gordian knot apparently shows up in another field: the one of politics and lobbyism. It remains to be seen when one can announce a breakthrough there as well. – Changes in the energy mix and integration of new energy sources: The high variability of renewables requires investing in stability and availability. – Establishing digital smart-grid technologies: As intelligent structures, small, distributed energy systems (e.g., battery swarms) will become part of markets such as the energy imbalance market. – Power-to-X: Besides Power-to-Heat and lithium-ion batteries, chemical conversion (Power-to-Value) will gain in importance. – Enhancements: Existing structures and technologies must be improved upon to be able to meet the new challenges and allow the best possible as well as the most sustainable use of infrastructures.